Network players have become so popular that today every old-school manufacturer needs to have one. Within this still growing segment, manufacturers either tack on streaming modules to a DAC; or design a pure network player with D/A conversion like Lumin and Linn do. In most cases, this leads to a focus on either the transport or converter section. If an existing DAC bundles with an OEM streaming module, one often sees limited functionality, particularly browsing capabilities within iOS or Android apps. Pure network machines meanwhile can mean limited digital inputs and run-of-the-mill D/A conversion. These are just general guidelines that won't apply across the board but still remind prospective buyers to investigate how good the OEM module and converter really are. Most such products today have UPnP capabilities whereby any UPnP control point can steer the player and the associated music library. Various freeware or very affordable apps cover the gamut from ultra sparse to sophisticated browser/player interfaces. A few years ago there were incompatibility issues between certain apps and machines; and most weren't as good as the best designed specifically for PC or Mac. The quite recent release of the BubbleUPnP server increased the range of possibilities. Now it's no longer an issue to design a network player with a focus on the hardware rather than particular software development skills. Now one can rely on 3rd-party apps unlike a few years ago when I reviewed the excellent audio performance of machines like Ayon's S5 or Bel Canto's Black. In my opinion, Bubble UPnP was a game changer. Before its appearance, it could be difficult to justify the pricing of expensive network players which lacked equally capable apps. Still, things are never so simple and the UPnP realm depends on a few contributors in the open licensing domain. Furthermore, BubbleUPnP, the core for OpenHome Media renderers, requires at least one working UPnP media server except when used with Chromecast. Such UPnP media servers like Minimserver are still somewhat complicated to install and technical support is limited to the developer's minimalist homepage and associated forums. Furthermore, BubbleUPnP was created by and relies on a sole individual. An alternate option is to run JRiver Media Center on a dedicated computer, then use the JRemote control point for Android or iOS. Nevertheless, the idea of adding another computer to my existing NAS is no favorite strategy when any decision for a network player is mainly motivated by the desire to avoid using a computer for music listening. But I confess that the JRemote app works flawlessly and that adding an affordable MacMini or small personal computer doesn't much increase the investment of an already costly network player. It's also possible to use apps like Foobar but their degree of sophistication and ergonomics is quite primitive compared to what already exists for the iPad or other digital tablets. 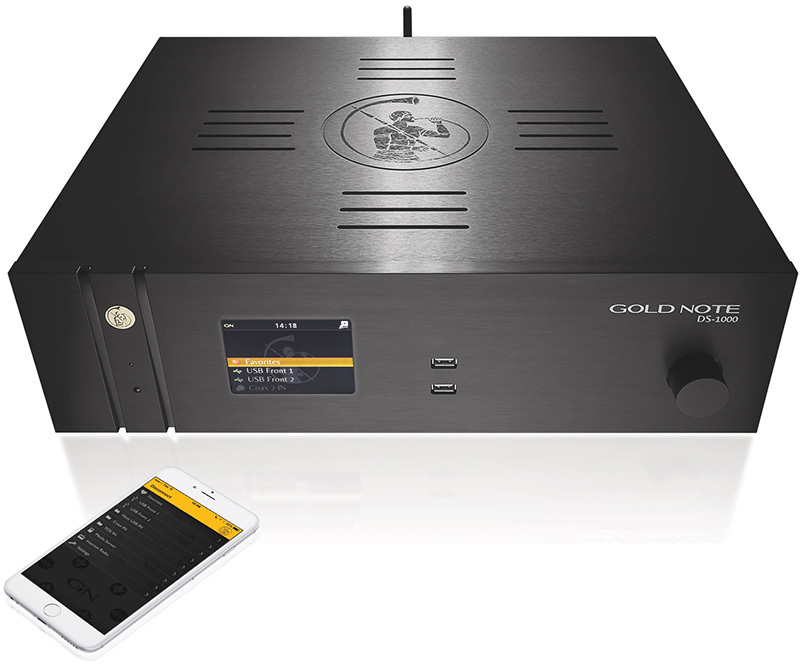 At first glance, the Gold Note DS-1000 differs slightly from most competitors. It was designed as a complete all-in-one device with WiFi/LAN, DSD streaming and a complete set of digital inputs including USB, then options for analog volume and XLR and/or RCA analog inputs. The DS-1000 includes a proper remote and even adds an iPad/Android app to navigate it and a music library. The second surprise is the rather affordable ask for such a sophisticated and complete realization. In short, this new kid in town looked extremely appealing on paper and I couldn't but accept when the review solicit arrived. Since I'm always interested to learn who hides behind a product, let me introduce the company and its designer. In the 1980s, Maurizio Aterini and Stefano Bartoli founded the firm near Florence/Tuscany under the name BlueNote. Being a graduate music professor, Stefano Bartoli left a few years later to focus on playing music exclusively. Maurizio Aterini went on to design his first products. First was a line of accessories like the Midas tube damper and Kymyas LP treatment followed by the Belvedere turntable, Bellaria Titanium unipivot tonearm, CD5 CD player, Reale floorstanding loudspeaker, Steroid amplifier and De Medici phonostage. Subsequently the company focused on OEM work for well-known brands until a decision in 2000 to launch their own brand. By 2007, the Akamai Group of Italy had acquired BlueNote and changed the name to Gold Note to avoid potential litigation with the famous Jazz label. Contrary to the average tiny size of boutique high-end makers, this Italian outfit employs a staff of circa twenty people at the factory while a group of four electronic lead engineers manage them. That's how big of a staff it takes to support a very extensive lineup of analog/digital sources, amplification, racks, cables and even 180g vinyl. Such front-to-back expertise and design flexibility seems to have created more independence from earlier OEM work.